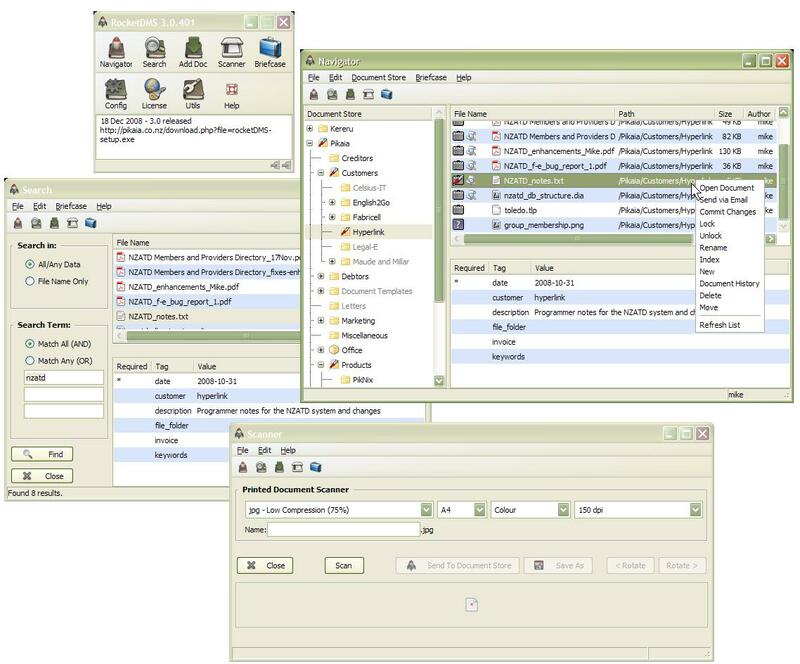 RocketDMS is a multi-user document management system. Ideal for individuals, organisations or businesses that rely upon the retrieval and use of paper and electronic documents. Provides a simple way of ensuring that one version of a document is retained, searchable and retrievable by anyone. All changes and versions of documents are retained allowing old document versions to be viewed. RocketDMS is simple and easy to use. RocketDMS is simple and easy to use. This is a native windows application that provides storage, tracking, search and retrieval of electronic, scanned and physical documents. Built in scanning tool lets you scan many pages into a single PDF document with just a few mouse clicks. Built in workflow and scheduling allows jobs to be created and tracked. Full text indexing of all documents (containing text) provides quick document searching. RocketDMS can be used as a GUI for Subversion and can be used with existing subversion repositories (>=1.6). Qweas is providing links to RocketDMS 6.3.133 as a courtesy, and makes no representations regarding RocketDMS or any other applications or any information related thereto. Any questions, complaints or claims regarding this application RocketDMS 6.3.133 must be directed to the appropriate software vendor. You may click the publisher link of RocketDMS on the top of this page to get more details about the vendor.